I absolutely LOVE LOVEEEE this chocolate frosting!! The sour cream makes it so creamy and you cant even taste there is sour cream in it! 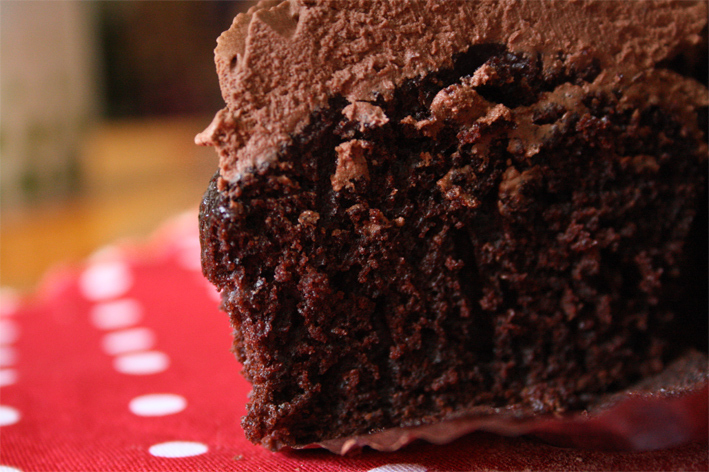 And what’s better than having real melted chocolate in your frosting? In fact, I reckon the frosting tastes just like chocolate mousse that melt in your mouth! SO TASTY!! 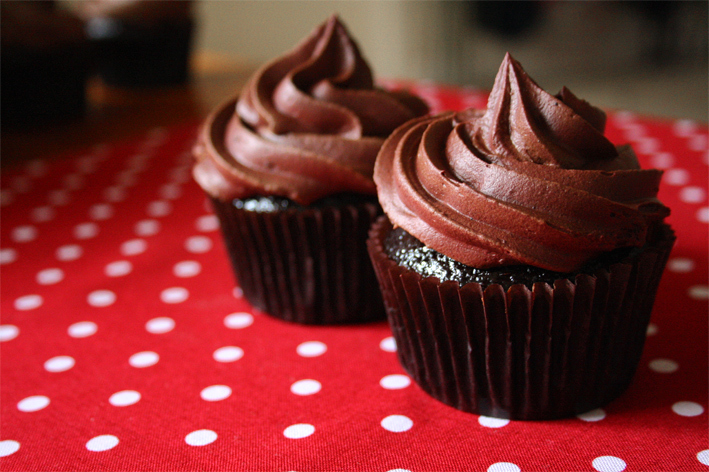 With a creamy frosting, a light but moist chocolate cupcake is the key to make this perfect combination. The cupcake recipe that I used is a lot like the one that I used in my mini caramel cupcakes and the lemon curd cupcakes. I love the oil base recipe – its so easy, leave no mess and the cupcakes always turn out light and moist! I actually had quite a bit of frosting left, enough to frost a few more cupcakes, just as I wasn’t sure what I’m gonna do with the them, Andy came into the kitchen and polish it all! But I secretly wishing I could lick it all myself! I took the cupcakes to work the next day for a girl’s birthday and they were a massive hit! Everyone loves it and said it was super-tasty! They all want the recipe for it! Though I soon regret giving out all my cupcakes, I ended up having one cupcake but really, I wanted six!! It was so good, I just wanted more…..
Sift together the sugar, flour, cocoa powder, baking powder, baking soda and salt in a bowl. 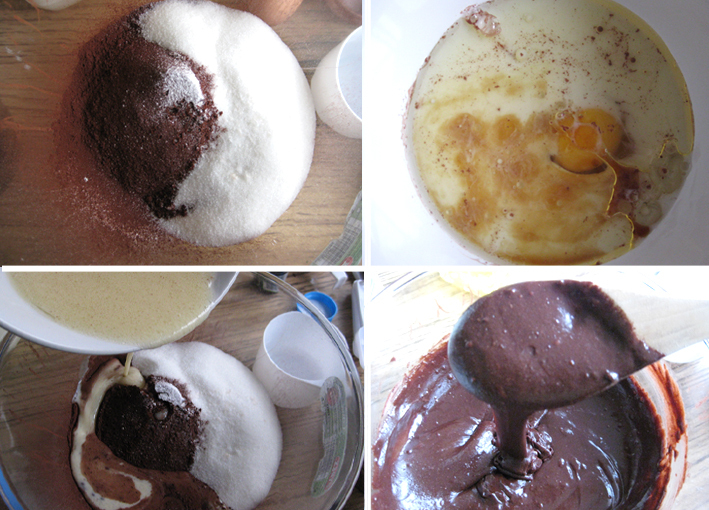 In another mixing bowl, combine the eggs, milk, vegetable oil and vanilla extract; whisk together. Add to the dry ingredients and mix with wooden spoon until mixture is combine. Add the boiling water and stir just to combine (batter will be thin). Transfer batter to prepared pans, filling each liner about 2/3 of the way full, approximately 1/4 cup of batter. Bake approximately 22 minutes, until a toothpick inserted in the center comes out clean. Cool in pans about five minutes and transfer to a wire rack to cool completely. The chocolate sour cream frosting sounds delicious! Your cupcakes look so adorable. I can’t wait to try out that frosting. It looks amazing. 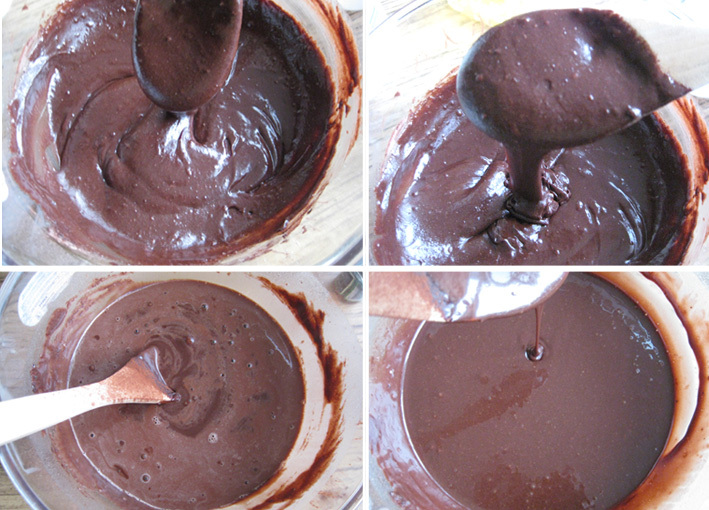 I always add sourcream to my frosting’s and cakes….the ganache looks gorgeous! This could become one of my favorite frostings, however, it calls for 4 1/2 unsalted butter. 4 1/2 what? I’m assuming Tablespoons, am I right? Looks great for the frosting – one thing though. 4 1/2 of what for the butter for the frosting? Tablespoons? Thanks for pointing out my mistype in the post! Glad you guys like the frosting! Oh my! these look gorgeous! That picture of the inside of the cupcake is mouthwatering!! Looks so good. Every time I try to add melted chocolate to my frosting, I always end up with chocolate bits. What is the secret to make it smooth with no chunks like yours? So, you said this is the base cupcake recipe? If you want regular cupcakes, you just leave out the cocoa? Do you add anything else? I have been searching for the perfect vanilla and chocolate cupcake recipes and I think this could be it? 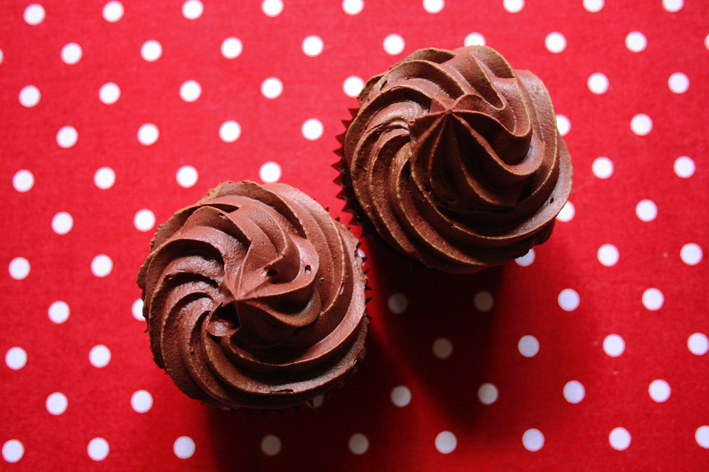 This is a basic chocolate cupcakes recipe that i use and LOVE! It has never failed and always come out light, moist and fluffy! And the frosting is to die for! This definitely is one of the best chocolate cupcakes I have had! I also have a basic vanilla cupcakes recipe that i turn to all the time, you can find it on my mini caramel cupcakes post, this recipe has a very similar texture to this chocolate cupcakes, so if you like a light and fluffy cupcakes, you will like this recipe, otherwise, if you prefer a denser, more tender cupcakes, then try the recipe from my vanilla cupcakes post! As for the frosting, make sure the buttercream (the butter, icing sugar and cocoa powder mixture) is nice and smooth before you added in the melted chocolate (of cause, the choco has to be completely melted, smooth and free of lumps too! ), that way you should have a very smooth and chunk-less frosting! Thanks for the info. I prefer light & fluffy cupcakes. Sorry one more thing, now that I am writing this recipe down, I can’t find a baking temperature. I am assuming 350 degrees? yep! Set oven to 180C (350F)! Sorry about that! I will bake them this week for my cousin 1st birthday party. those are beautiful. i can smell them through the screen! Just sour cream and pure cocoa powder is my “chocolate mousse” dessert of choice so frosting with both ingredients is definitely something to try. might i suggest adding the icing sugar in 1/4 cup at the time, so the butter can incorporate little bit of icing sugar at the time, it will help to create a smoother/non-lump frosting. And prehaps, increase the butter to 90g and just use 1 cup of icing sugar + 3 tablespoon of cocoa powder first to see how the buttercream turns out, if the consistency is good then go ahead with the rest of the ingredients, if u find it is still a bit wet then add 2 tablespoons of icing sugar at a time to reach a smooth/firm consistency. (and make sure that the butter is beat to a pale and fluffy stage before adding the powder mixture in). I am away on holidays at the moment but i will definitely make this again and let you know if any changes need to make! I hope that helps!! hey i tried the cupcake recipe and they were really good! 🙂 I haven’t tried the frosting though.. i never really tried making frosting before but yours seem really tempting! Guess i’ll be trying them soon 🙂 thanks for sharing! These are devine, thank you!!!! I really wanted to do half dark half white chocolate but the white chocolate didn’t work out! So strange! Any suggestions? I have never tried using white chocolate, so I’m not why wouldn’t it work out! I might have to try it out myself to see! When I read that this frosting was like chocolate mousse on Tastespotting I had to check it out. It looks delicious! Can’t wait to try this recipe out! Sounds yummy! Thanks for sharing. Your cupcake looks awesome! I wanted to make these cupcakes for a wedding and was wondering how long can I leave the frosting out for and also would I be able to make the frosting a day before? I know you say to frost immediately, is there a reason for that? The reason to frost immediately and prefer to eat on the same day is because the frosting contains sour cream in it, so if you leave the frosting out over night, the sour cream in it might go bad. You can frost the cupcakes and store them in the fridge, take the cupcakes out 30mins before you want to serve (so they can return to room temperature). And you can also prepare the frosting in advance and store it in the fridge, when you are already to use it on the day, take out the frosting and give it a quick whip again and then it will be already to pipe! Hope that helps! The cupcakes turned out absolutely amazing! I don’t think I’ve ever tasted such great chocolate cake before. I had a little problem with the frosting. It didn’t turn out smooth, it had bits of chocolate in it. It tasted great though! Any suggestions as to why this would happen? Hey Sarmin! I am glad the cupcakes turn out great for you! As for the frosting, make sure when you beat the butter and icing sugar together, they are completely combined, smooth, light and fluffy before you beat in the melted chocolate (make sure that it is completely melted and has no lump of chocolate in it too). That should give you a smooth frosting! 🙂 I hope that would help!! Thanks again for trying out my recipe! I have used this recipe twice and found that if I let my sour cream and butter both get to room temperature then my frosting turns out lump free and oh so delicious!!! What a great tip! Glad you like the frosting! Just curious but with the sour cream, do these need to stay refridgerated? They look so good! Hi there! When I did mine, I jus had them sit in room temperature overnight and finish the rest of the cupcakes the next day, but it was a cool night then! i think storing them in the fridge will be the safest option, bring them back to room temperature to serve! 🙂 Hope that helps! these look lovely… i like the idea of using sour cream rather then cream cheese … must try this frosting! These chocolate cupcakes look out of this world. And that frosting.. I am such a choco-aholic and this is not helping me lol. Really love this post. I made the cupcakes for a family picnic and they were a hit, thanks for the photos it helped heaps and I must say I was worried about the boiling water at first as the mixture turned to thick liquid….on the plus side though iy was mess free to fill the cupcake holders as I used a pouring jug and the cupcakes…….well they were DEVINE!! Thanks for sharing and I doubt I’ll ever try another recipe this one was perfect! Oh no! I am so sorry to hear that 😦 I hope you will try this again and hopefully it will work out next time! No problems with lumps. I beat the heck out of it. LOL! Thanks so much for such a great recipe!! That’s wonderful!! So glad you like this recipe frosting! and thanks for your update on a large cake as well! It sure will be very handy for me! I just made this frosting it’s DELICIOUS!!! thank you so much for sharing it! I’ve been looking for a chocolate frosting that is not a simple ganache yet also not too sweet, and I FINALLY FOUND IT! thank you thank you thank you! 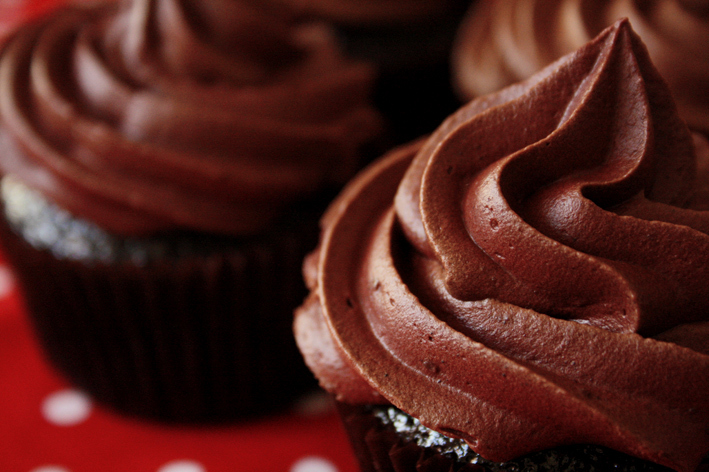 this will be my go-to chocolate frosting now! simply amazing! Thank you so much Bella! I am so glad you like this recipe! In fact, I just made this cupcake recipe this weekend too!! The frosting really is to die for! Hi! The frosting looks delicious! I’ll try it someday! Thank u for the recipe! To all u Girls that had problems with the chocolate going lumpy; my thoughs are that maybe when u incorporate the warm chocolate to the butter mixture and then the sour cream, the sour cream and the butter must be at room temperature because if u pour in a cool ingredient into warm or hot chocolate the chocolate will inmediatly solidify with the suden change of temperature. Try it again and let me know if it worked! Hi Luisa! What a great tip! Thanks so much for sharing your thoughts! Hi, exactly how much chocolate is 170grams. I’m planning to try this recipe this weekend. It is about 1 cup or 6 ounces. Hope you enjoy this recipe! A great, simple and foolproof recipe! I love the quick cooking time and fluffy freshness! I do candy buffets and was recently told by a (very fit and healthy eating) man that they were the best cupcakes he’d ever eaten! So compliments all round! 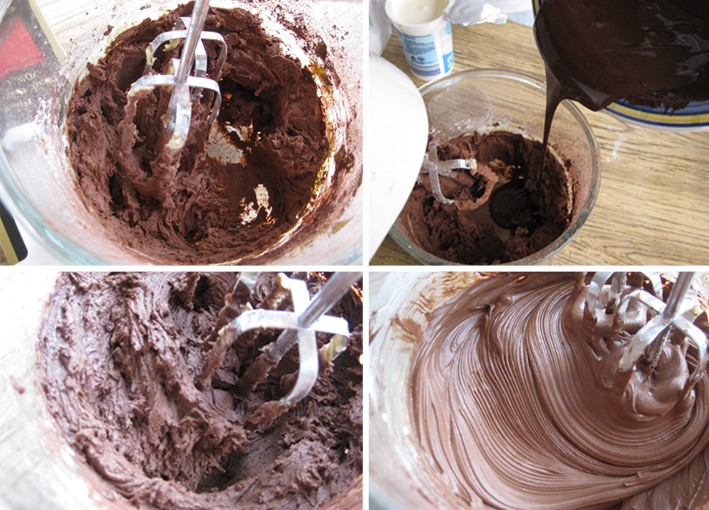 BEST Chocolate Sour Cream Frosting ever!! Cupcake Frosting Recipes. The Cupcake Daily Blog.